Piano package with quality headphones, stand and bench. 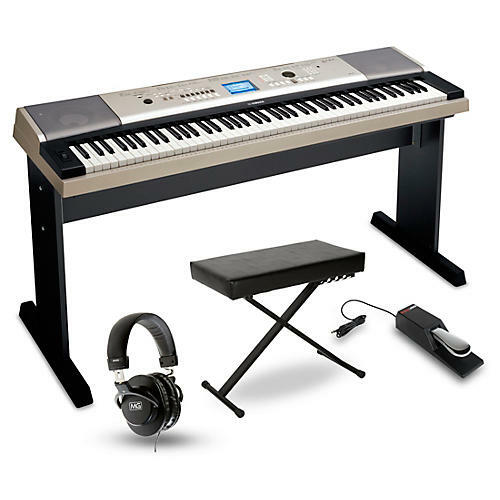 This package pairs the Yamaha YPG535 digital arranger piano with the Musician’s gear keyboard bench and a sustain pedal. It comes with a professional-quality set of headphones as well. The 88-key Yamaha YPG-535 Portable Grand Piano Keyboard combines a strong, well-built integrated stand, graded soft-touch action, and Performance Assistance Technology to deliver an enjoyable and flawless playing experience. Organized song title lists in the pianos music database provide complete and easy keyboard setups while the onboard song recorder offers adjustable sound with 5 types of Master EQ. Standard sustain pedal with switchable polarity, usable for any model keyboard with a 1/4" damper pedal input. Larger chassis with rubber skid on the bottom to prevent your pedal from jumping around on hard floors. Silent operation, quality cable. Now you can control your keyboard a more realistic piano feel with a Proline PSS2 Professional Sustain Pedal. It works with any keyboard, and its heavy-duty construction and stable-grip rubber soul provides superior stay-put characteristics on stage and in the studio.